The smell of vinegar simmering in the kitchen can be overpowering for some, but the aroma transported me back to my youth. A time when many people had backyard gardens and faithfully put up a cupboard full of summer fruits and vegetables. I suppose this in homage to the “Victory Gardens” as they were called during World War II. Everyone did their part for the war effort by contributing to their sustenance as a way of guaranteeing that there would be enough food for the soldiers and those in need, or without the means. Mom didn’t can, and I was never there when Grandma did. My exposure to this wonderful practice came at the hands of Mrs. Louis Busch Jr.
Louie taught me how to sit a horse, break, train and care for the animals. I hung on his every word because every lesson he shared had come from years of hard earned experience. I can still see the grin on his face if I messed up. He’d have this great laugh that was almost timid as if he was embarrassed to laugh heartily. He’d spit tobacco juice on the ground and he’d say “Boy, let me show you something.” He had a kind way of instructing without making you feel stupid. He offered praise willingly, and it meant the world. I miss him. What in the world does this have to do with Sweet Corn Relish? Sorry. I get carried away when memories start pouring into my head. Louie’s wife (Verla) was a county Extension advisor in our county and was loved and highly respected as was her husband. In the autumn, she would send Louie with an armload of freshly canned goodies. My favorite was what Louie called “Piccalilli” Oh My! 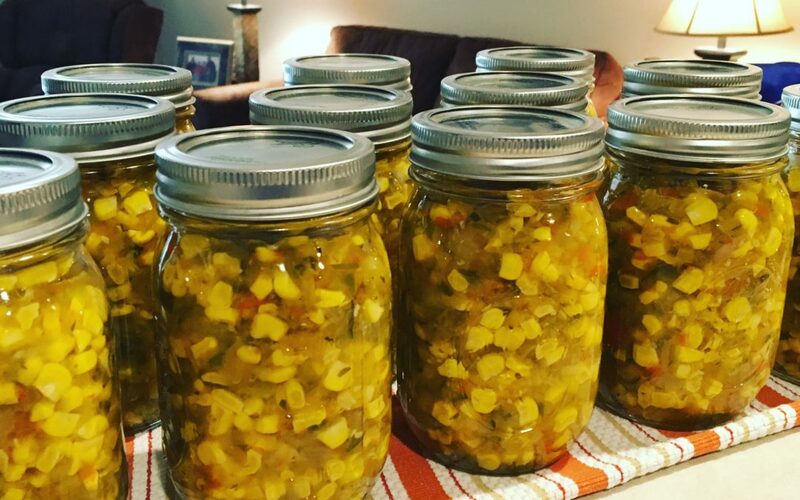 Fresh from the cob sweet corn-Pickled. SO delicious that a tear would run down my cheek when it was gone. I have been dreaming about this stuff for 30 years. I Do NOT have her recipe, although I’m going to try to track down their daughter to see if she might have it. I decided just to go for it, and see what happens. It certainly isn’t what I remember, although it IS good. Regardless, I’ll keep trying until I get it right. 12 fresh ears of sweet corn, husks and silks removed. Slice kernels off the cob. NOTE: I purchased a packet of bread & butter pickling spices at a store that sells Canning supplies. I put the packet ingredients in a cheesecloth and tied it with Butcher’s twine to simmer with the liquid & vegetables, then removed it at the end. You may substitute by using 1 Tbs of whole allspice berries and a Tbs of whole yellow mustard seeds and a bundle of fresh dill if you like. NOTE TWO: I have also chopped veg into large chunks (NOT the corn) and successfully pulsed the food processor a few times to get the perfect chop. Bring vinegar to a boil, add sugar and salt to dissolve. Add seasonings and vegetables, lower heat to medium and simmer for 10 minutes. Ladle the relish into hot sterilized jars and seal with lids. Store jars in a cool dark place. Good for a year. Once opened, jars can be stored in the fridge for up to two months.